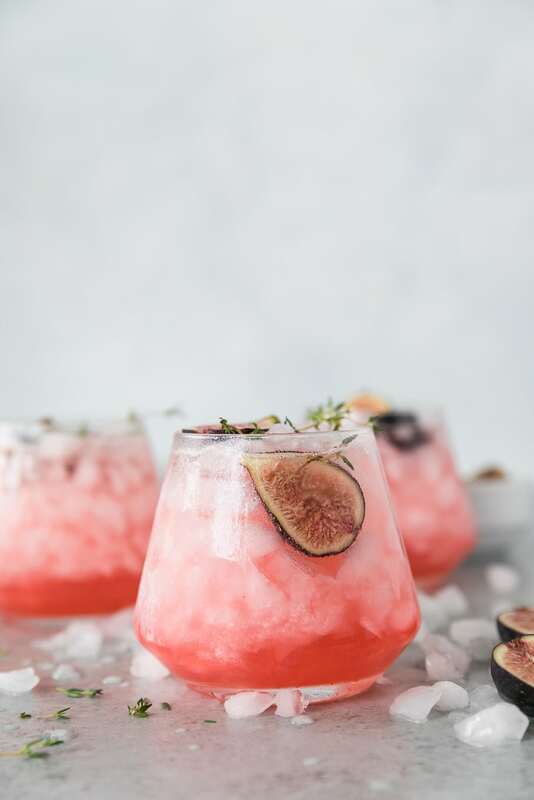 This Fig Thyme Shrub Cocktail is a perfect way to celebrate the late summer figs and the beginning of fall! It’s the perfect mix of tangy and sweet, and the fresh thyme adds an unexpected, but delicious note of herby flavor. 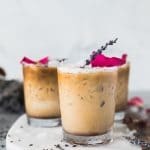 The shrub mixture keeps really well in the fridge for a couple weeks, so it’s perfect for making cocktails whenever you want! I also love adding it to sparkling water with a little lime! If you’ve never had a shrub cocktail, you HAVE to try this. I know you’re probably thinking, “what in the literal heck is a shrub..?” And just trust me on this one. I know it sounds bizarre, but if you like vinegary, tangy things, you will LOVE this. Basically, a shrub is a mixture of sugar, vinegar, and fruit that steeps overnight in the fridge, basically to create a “drinking vinegar”. You can add it to cocktails, any kind of beverage, and really whatever you want. It’s absolutely delicious and unexpectedly addicting. The first time I had a shrub cocktail was out at a restaurant with fun drinks, and I tried this tequila shrub and it was INCREDIBLE. I’m definitely a tequila lover (for sure my liquor of choice), and I knew I had to try making it at home. This one is vodka based, but it’s so refreshing and good. 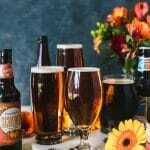 It’s seriously SO easy, and the shrub keeps really well in the fridge for a couple weeks! So that means cocktails at-the-ready! I’m always up for that, especially by the time Thursday hits after a loooong week. And I’ve been having a lot of those lately. If you like vinegary things, anything pickled, and/or tangy, you will absolutely love these. Seriously. I know it sounds bizarre, but they’re incredibly refreshing and delicious. And not too sweet – which I love as well. You really don’t even taste the alcohol in these, which is just sliiiightly dangerous. 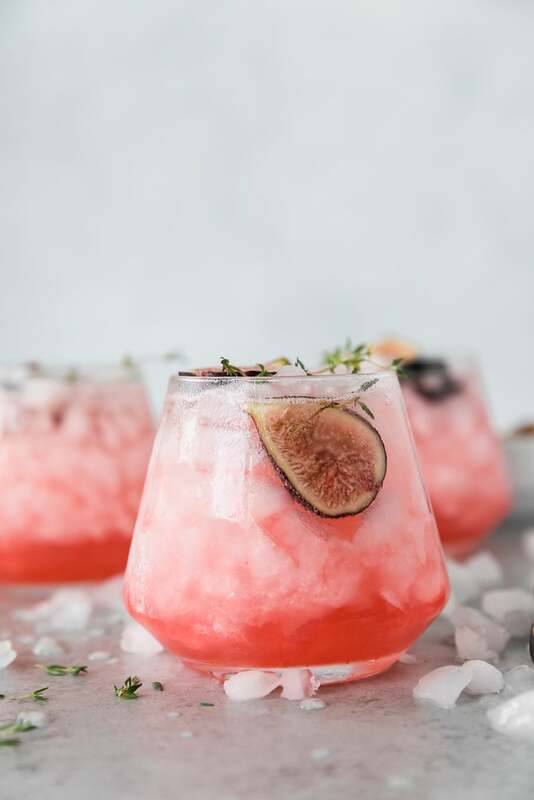 These are the perfect cocktail to bridge the gap between summer and fall, when you still might want something refreshing, but not so summery. 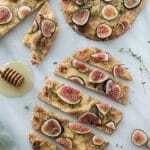 The fig and thyme combo is one of my faves – like these flatbreads. OMG. They would actually pair amazingly together! 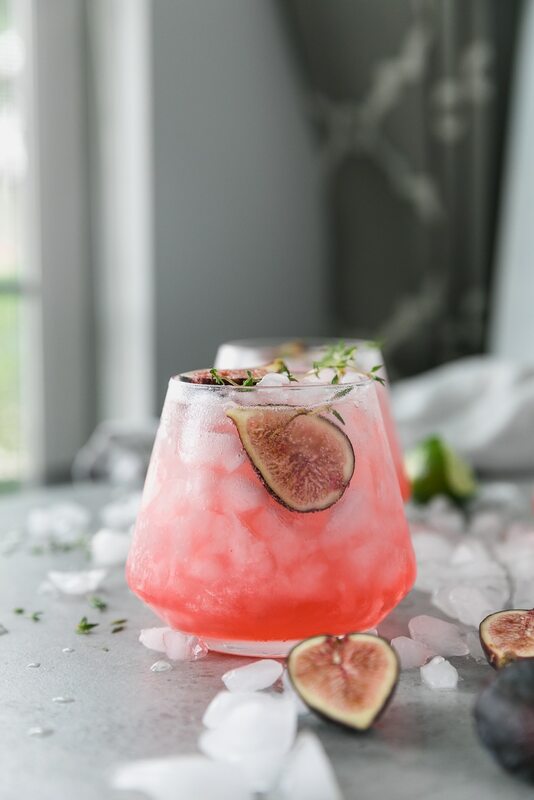 This Fig Thyme Shrub Cocktail is a perfect way to celebrate the late summer figs and the beginning of fall! It's the perfect mix of tangy and sweet, and the fresh thyme adds an unexpected, but delicious note of herby flavor. 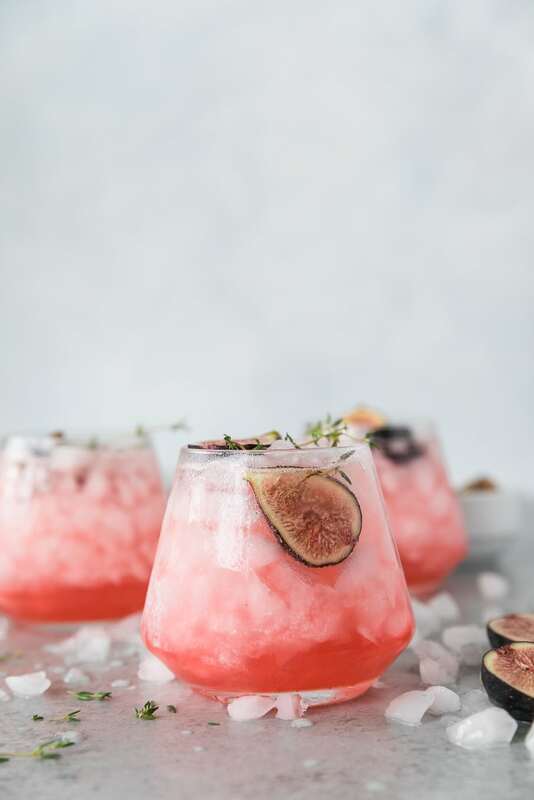 The shrub mixture keeps really well in the fridge for a couple weeks, so it's perfect for making cocktails whenever you want! I also love adding it to sparkling water with a little lime! Make the shrub. 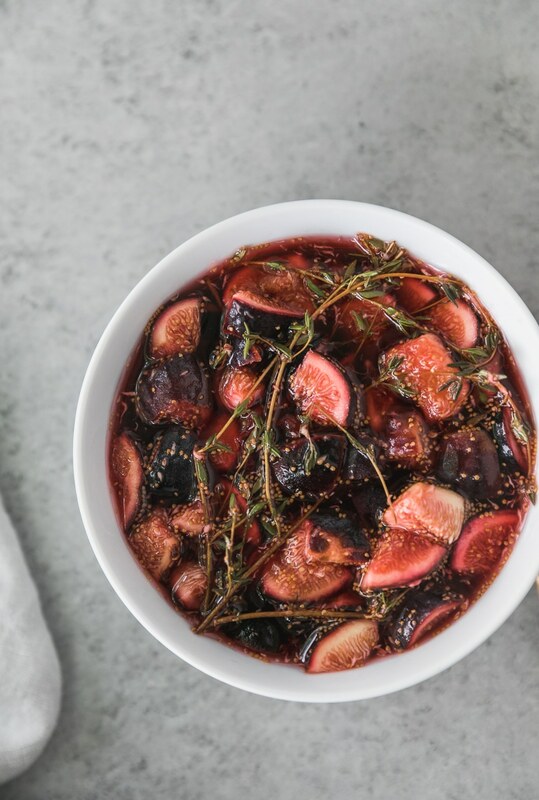 In a medium plastic or glass bowl, combine the figs, sugar, vinegar, and thyme. Stir to combine, cover with plastic wrap, and let sit in the fridge overnight. In the morning, strain through a fine mesh strainer and discard the figs and thyme. 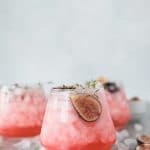 To make the cocktail, add crushed ice to a glass. Add the vodka, lime juice, and shrub and stir to combine. Add the club soda and stir again to combine. 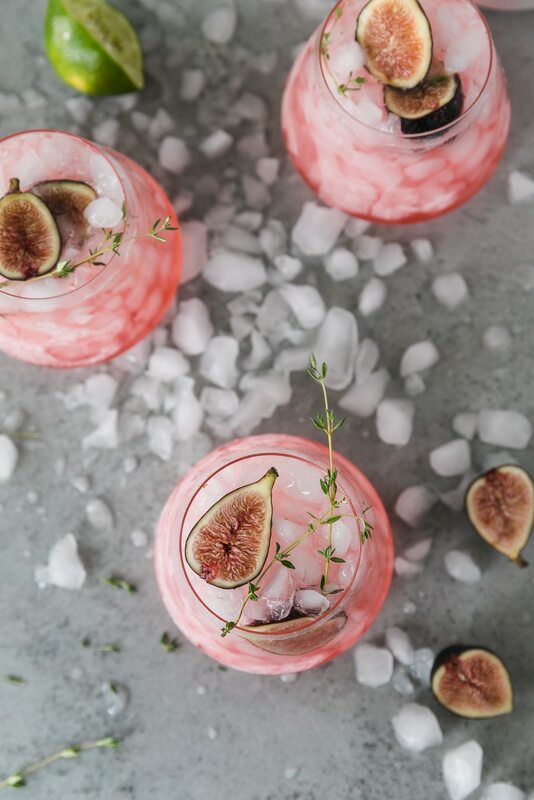 Garnish with figs and a sprig of thyme! 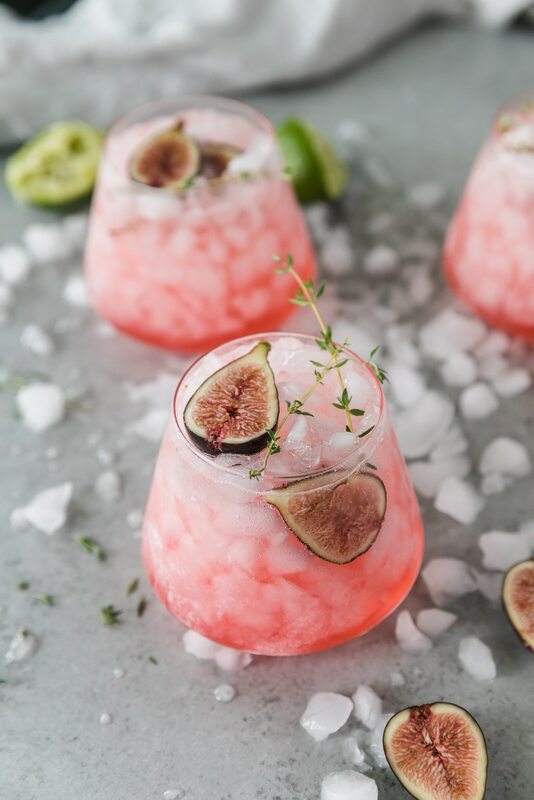 *Leftover fig thyme shrub will keep in the fridge for up to 2 weeks. It's delicious used in cocktails of course, but I love serving it in some sparkling water with a little lime too!